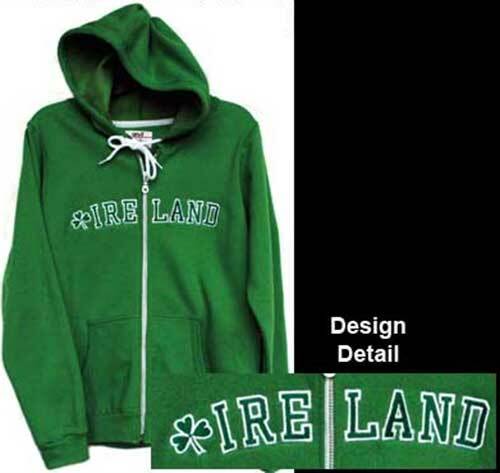 Women's Irish hoodie is a full zippered feminine sweatshirt that features an embroidered Ireland along with a shamrock. This Irish sweatshirt for women features a contrasting white metallic zipper and circular draw cords along with triple needle stitching on the neck, shoulders and waistband. The Kelly green Irish hoodie for women features a full length zipper along with an Ireland and shamrock design. This feminine Irish sweatshirt is both trendy and practical and it is an Anvil 75%/25% cotton and polyester blend. This women's Irish sweatshirt is embroidered in the USA; it is received with a shamrock history card, complements of The Irish Gift House. Irish sweatshirt for women is an embroidered hoodie that features the Claddagh along with shamrocks and Celtic knot-work. Irish hoodie for women features a full zipper along with Ireland and a shamrock. Irish sweatshirt for women is an embroidered Kelly green design that features the Claddagh along with shamrocks and Celtic knot-work.